The fall of a legend is always a mournful moment, particularly when said legend falls on their own sword, but it's strangely fitting that Candlemass have wielded the weapon against themselves. Such a colossus in the world of doom, the heir to Sabbath in many ways, deserves to fall to no foe, to no other hand than its own. So the declaration that Psalms For The Dead was to be their final album ramped up a great deal of speculation and interest, and expectations were naturally high for it, not least because their previous opus, Death Magic Doom, was a triumph. And those expectations are met, and matched, from the opening riffs of the almighty Prophet and beyond. 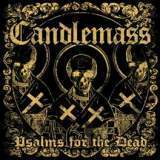 That opening blaster alone is brilliant, classic Candlemass at their most galloping and anthemic, with a gloriously catchy chorus and a sudden shift in tempo towards the end that can only go down a storm live. And things just get better! The opening to The Sound Of Dying Demons is none more Sabbath with its militaristic drums, Iron Man-esque droning riffs and crackling thunder, Lowe at his most epic and foreboding as he wails and growls - an outstanding performance from the vocalist. Not that guitarists Lasse and Mappe aren't on form either, indulging in copious joyful leadwork with more than a touch of 80s heavy metal to it, especially in the gleefully bonkers Dancing In The Temple (Of The Mad Queen Bee). Glorious slow, horrorstruck doom and gloom is to be found in the dread Waterwitch, whilst there's a a delightful Eastern flavour to The Lights Of Thebe. The title track is probably the closest thing to what you'd expect from Candlemass, having heard the previous album, but even that is enhanced by Hammond organ. Several songs here have touches of that fun instrument, particularly Siren Song where it even gets its own solo in a way that had me thinking of old Uriah Heep. Yet the ones without are just as good, the apocalyptic The Killing Of The Sun particularly with some guitar soloing that will make you not care if the sun was snuffed out, and although the spoken word sections in Time Is Black are a little Monty Python-esque (and not in a good way) the surrounding crunchy riffage is more than good enough to keep you headbanging. All in all, it's quite a remarkable display of songwriting skill for sheer variation alone, but each song is a killer with something unique to offer, each a stellar doom anthem. If this is to be Candlemass' final album (let's be honest, the band changing their mind and making another album half as good as this would be very welcome) then it's a hell of a bang to go out on; a collection of excellent tunes that grips from the first listen and proves its quality more on every listen. The masters have done their best once again, and they can retire knowing that Candlemass has gone out on a high.